Khichri/Khichdi/Khichuri is derived from a Sanskrit word simply meaning rice and lentil. Egyptians and their neighbours add vegetables to it, while the Indian sub-continent likes to serve it with yogurt or other forms of curries. 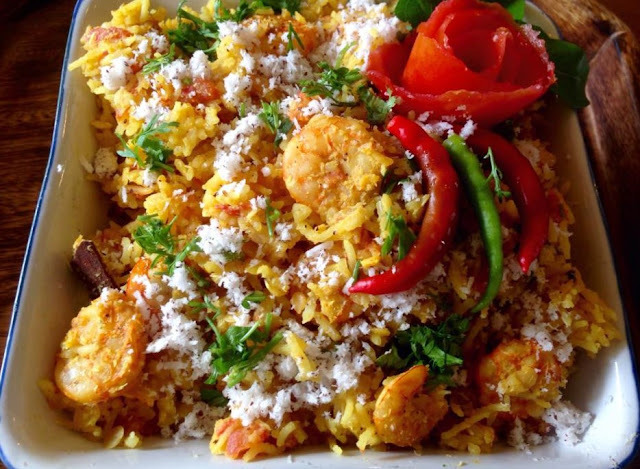 The people of Maharashtra living on the Arabian Sea however tend to add shrimp to their Khichri. Healthy and simple, the plain Khichri is generally the first forms of solid food introduced to babies. Being affordable and a complete meal in itself, it is the food of the masses. Many cultures dedicate a meal of Khichri during their week of wedding festivities; yet it is never served at the wedding! In a blender roughly chop together fried onion, green chillies and garlic. In a deep pot heat oil and quickly saute`the above vegetables with the salt, cumin and turmeric powders and the cinnamon,cloves, black pepper corns and lightly broken cardamom. Now add the coconut, tomatoes, mango, sugar and finally the prawns. Mix well and then tip in the washed rice and lentil. Top it with water giving it a light stir, bring it to a rapid boil. Lower the heat cover and steam for 20 -30 minutes until cooked through. Serving accompaniments are pappadum, green mango chutney and yogurt raita. Traditionally this recipe also has a vegetarian version where the prawns are substituted for 6 ripe small baby mangoes, skin on. The flesh is deep yellow while the skin is thin enough to enjoy. Gently squeezing the mango before adding them will help break down the flesh into pulp and cook more evenly. Out of season larger mangoes, can be prepared and kept aside for 30 minutes. Peel, cut into chunks and lightly sprinkle with salt, sugar and lemon juice before adding it in. If you prefer use 1/2 tsp of garam masala instead of whole spices. 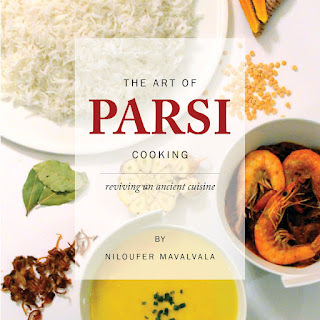 For more Parsi Food recipes read my cookbook The Art of Parsi Cooking; reviving an ancient cuisine. Thank you Gooli Mama. I am so happy you enjoyed it.